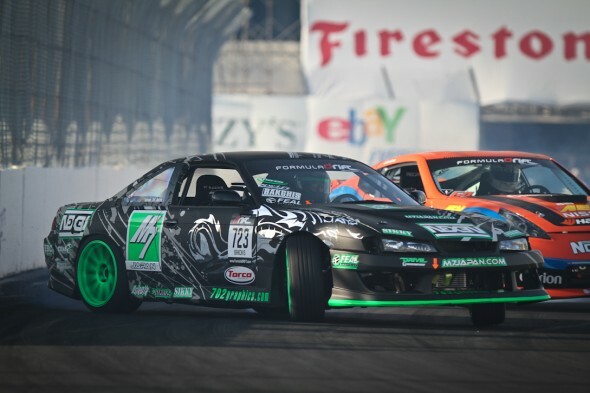 For immediate release – The 2012 Formula Drift pro championship kicked off at Round 1 in Long Beach, California on April 6 and April 7 and proved to be a success for driver Aurimas Bakchis (Odi) and the Team M7 Japan Nexen Tire Nissan S14. Bakchis placed 15th in Round 1, further demonstrating that his 2011 “Rookie of the Year” title was well deserved. Entering the season as the driver for Team M7 Japan, Bakchis debuted a new motor for his Nissan 240SX S14 chassis, upgraded suspension, and a new look. With a field of 60 drivers qualification scores were tight; Bakchis ranked 30th after Friday’s qualifying round and was paired with Vaughn Gittin Jr. for the Top 32 tandem competition. Gittin straightened during the first run of the Top 32 tandem round and Bakchis then led a strong, aggressive run that moved Bakchis on to the Top 16 main event. Bakchis was paired with Ken Gushi for the Top 16 tandem competition. Gushi led the first run and then failed to follow Bakchis on the second run in what was determined to be a false start by Bakchis. After an exciting lead run by Bakchis, Gushi moved on to the next round and Bakchis finished the event tied for 15th place with Toshiki Yoshioka. Round 1 was both exciting and successful for Bakchis, providing a strong start to the 2012 season. The season promises to be exciting for Bakchis and his team as they prepare to head to the east coast for the next three rounds of Formula Drift. Bakchis will be completing the season with the help of sponsors including M7 Japan, Nexen Tires, Feal Suspension, 702 Graphics, Clutch Masters, Torco, Drive M7 Energy Drink, Dstroyr, Battle Version, Swift Springs, EBC Brakes, Top Line, XXR Wheels, Sikky Manufacturing, and CBM Motorsports. Posted in FD News | Tagged Aurimas Odi Bakchis, feal suspension, Formula D, Formula DRIFT, Ken Gushi, Nexen Tire, round 1: streets of long beach, Toshiki Yoshioka, Vaughn Gittin Jr.